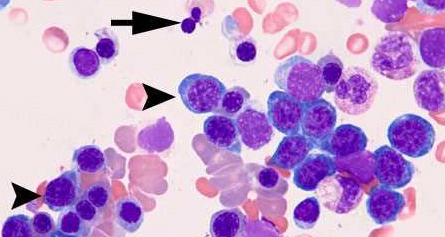 Refractory anemia with ring sideroblasts (RARS) is a myelodysplastic syndrome (MDS) characterized by isolated erythroid dysplasia and 15% or more bone marrow ring sideroblasts. Ring sideroblasts are found also in other MDS subtypes, such as refractory cytopenia with multilineage dysplasia and ring sideroblasts (RCMD-RS). A high prevalence of somatic mutations of SF3B1 was reported in these conditions. To identify mutation patterns that affect disease phenotype and clinical outcome, we performed a comprehensive mutation analysis in 293 patients with myeloid neoplasm and 1% or more ring sideroblasts. SF3B1 mutations were detected in 129 of 159 cases (81%) of RARS or RCMD-RS. Among other patients with ring sideroblasts, lower prevalence of SF3B1 mutations and higher prevalence of mutations in other splicing factor genes were observed (P < .001). In multivariable analyses, patients with SF3B1 mutations showed significantly better overall survival (hazard ratio [HR], .37; P = .003) and lower cumulative incidence of disease progression (HR = 0.31; P = .018) compared with SF3B1-unmutated cases. The independent prognostic value of SF3B1 mutation was retained in MDS without excess blasts, as well as in sideroblastic categories (RARS and RCMD-RS). Among SF3B1-mutated patients, coexisting mutations in DNA methylation genes were associated with multilineage dysplasia (P = .015) but had no effect on clinical outcome. TP53 mutations were frequently detected in patients without SF3B1 mutation, and were associated with poor outcome. Thus, SF3B1 mutation identifies a distinct MDS subtype that is unlikely to develop detrimental subclonal mutations and is characterized by indolent clinical course and favorable outcome.